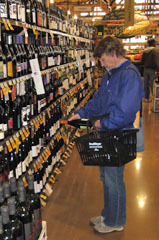 Are You Resuming or Resetting Your Wine Buying Habits? By John ~ July 23rd, 2010. Almost all of us have changed our spending habits to some degree during the economic storm of the past few years. The big unknown for all businesses is how we will respond once we feel comfortable about the economy again. Will we race right back after luxury goods of all kinds, including wine, or will the â€œlooking for the good dealâ€ mentality persist? More specifically, will you be resuming or resetting your wine buying habits? Please comment and tell us what you plan to do. The Nielsen Report, in a June 16 news release, summarized the results of their recent research in the following headline: â€œConsumers Who Trade Down Satisfied with Quality, Likely to Continue to Buy Less Expensive Alcohol Beveragesâ€. Lettie Teague, in her July 10 wine article for the Wall Street Journal, said that Chris Camarda, owner and winemaker of Andrew Will [whose wines historically garner rave reviews and top prices] told her that his sales were so slow he was holding back the wines of his latest vintage until those of the previous vintage cleared the shelves. And this year, he said, he is cutting production by 40%. On the other hand, in another part of her article, Teague noted that Ste. Michelle Wine Estates, a huge Washington value wines producer, saw its net revenue jump 26.7% from the previous yearâ€™s first quarter. Mike Veseth, The Wine Economist, noted in a recent post that his email inbox has been hopping with famous Napa wineries offering their wines at deeply discounted prices. â€œThe typical deal I am offered is â€˜limited time onlyâ€™ 50% off the retail price plus discounted shipping.â€ As you can imagine, those kinds of offerings even make life tougher for the Chris Camardas of the world. And from what I hear and observe, there are hundreds of other wineries with inventory stacked to the ceiling in California and Washington and other places that have not yet faced the realities of the marketplace. As for our family, I believe we definitely fall in the â€œresetâ€ vs. â€œresumeâ€ camp, despite Jeffâ€™s fears about the population at large. We have made some lifestyle changes that I believe will be long lasting. I do not see us rushing back out to upscale restaurants as much as we used to, and especially not to buy $30+ bottles of wine marked up to $100+, no matter how strongly the economy rebounds. We have too much good wine at home that weâ€™ve bought at reasonable prices. We also cook and eat at home much more than we used to, as you can tell by our Challenging Wine Pairing series, and our reports of other private tastings with dinner at home. These activities have become family favorites and are not likely to change with the economy. Lastly, we simply get more satisfaction out of a â€œgood dealâ€ than a â€œstatusâ€ purchase. Thatâ€™s why we emphasize our QPR [bang for your buck] ratings on wines that we review. What about you? Will you â€œresumeâ€ or â€œresetâ€ your wine buying habits? Not only would we like to know, but also wineries are desperate to know your answer because it will affect their long-term livelihood. We also seldom drink in restaurants any more, unless there’s a sale. We drink less wine and more beer (my husband is a homebrewer). When we do buy wine we buy locally produced when possible. I’m in the reset group. No more expensive wine for me. I’ve found more than enough good, inexpensive wines from Washington! No two buck chuck, or silverlake junk though. It’s a great topic. We’ve been trying to reduce wine consumption at home in general, which inevitably leads to spending less. For us, since we’re a little picky about wine, it also means the potential to spend about the same while getting more moderately priced or occasionally expensive wines, rather than bargain values all the time. That lets us mix it up more at all price points so we don’t feel deprived. I’ve been buying more imported Italian and German sparkling… water recently. At $2 to 3 a bottle, that’s a bargain compared to Napa cabs of any level or French almost anything. My wife and I never spent a *lot* of money dining out, but now when we feel like treating ourselves and spending $100-200 on a single meal out we have often instead headed down to Woodinville and picked up a couple of our favorites. We’ll spend $50-80 on a couple of bottles, head to Whole Paycheck and pick up some great food, and eat like Kings for the entire weekend sitting out on our deck. We almost always buy our more expensive wines direct from the winery. We like the outing, the people, and giving a higher share of the cost direct to the producer. More and more eating out for us is becoming a convenience thing and something we’ll do with friends or during the week if we don’t feel like cooking. Now that I know the price of wine, I just hate going to a restaurant and buying a glass of wine for $8 that I can buy a bottle of for $12. The markup is insane. They need to instigate a corkage fee for their bottles and not just mine. Take the MSRP and add $5, and that should be the price. As for regular wine drinking, we’ve never spent a lot of money on wine for non-special occasions finding that we can usually stay in the $8-12 range and find quite decent wine that doesn’t make us wince. This weekend we’ll be spending time with friends at our house, eating at home again. The weather is beautiful, the grill is ready, and the wine from Walla Walla is waiting patiently in the cellar. We’ve always been a bit prudent about buying wines and prefer to find “good deals” most of time prior buying wine other than everyday drinking wine. Part of my problem is that I know all too well what the wine costs retail and I agree with John that wine at home with good food is always a great candidate for a nice evening meal. Will I still buy some of my “allocation” from Quilceda Creek and Cayuse? Probably, but now in the quantities I used to. I am just as happy with Garagiste Wines, Full Pull Wines, certain wineries that offer great deals that come to my inbox and hence give me a chance to travel up north to pick up that wine and taste while I am there! So am I resuming or reseting? I guess we are just being more prudent and having fun along the way! Thanks Wendy, Carol, Stevie, Matthew, and Brian for your thoughts on “reset” vs “resume”. So far, it looks like “reset” is the prevalent theme. Great post John. I reset, but I did it several years ago. A change in lifestyle made me realize that entertaining at home enjoying good food and wine with friends and family is much more satisfying than going out. I still go out once in awhile, but lately I prefer going out for breakfast or lunch instead of out to dinner. While I’ve always practiced reasoned prudence in my wine buying, I have (and will in the future) make room for those special bottles — now that they have dropped considerably in price! I do search them out, hunting for the best wines at the best prices. So a bit of a re-set, taking advantage of the re-setting price structure. Thanks, Catie. We’ve been doing more of lunch out rather than dinner as well. It’s better for your health, too. Thanks for sharing those facts. Hope things are going well at Hollywood Hill. More of a reset on this side as I have taken more to sharing our wine with friends and family rather than hording it. It should be enjoyed rather than sitting on a shelf.